Etruscan civiliaztion existed with a distinct language and culture during the period of earliest European writing, in the Mediterranean Iron Age in the second half of the first millennium BCE. Most of Etruscan religion and mythology became part of classical Roman culture, including the Roman pantheon. The Senate adopted key elements of their religion, which were perpetuated by haruspices and noble Roman families who claimed Etruscan descent, long after the general population had forgotten the language. 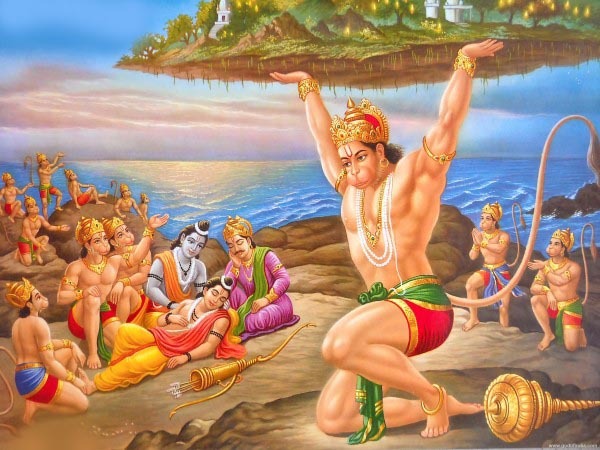 Their religion had multiple spirits and dieties and many paintings have scenes from Sanskrit epic poem Ramayana, which is the oldest of all literatures in human civiliaztion. There are multiple evidences with available paintings that Etruscan civilization was connected to Indian subcontinent. The Etruscan god Typhon is seen to be similar to Lord Vishnu’s carrier bird Garuda, who has wings and can fly. Garuda is a monster bird born to Vinata out of her second egg. His elder brother is Aruna, who was born out of vinata’s first egg while she decides to break it before maturity. Aruna is thus born without legs and goes on to become charioteer or Surya (Sun). Garuda is against serpants and is usually depicted with snakes at his feet. 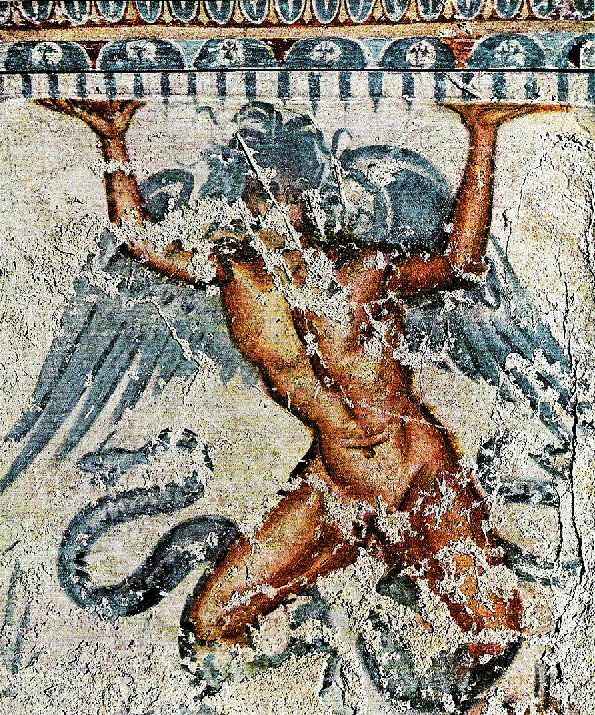 In Etruscan, Typhon, is a titan with serpent-legs. Typhon, or Typhoeus, was a monster born to Ge that had a hundred burning snake heads and spoke with voices of men and animals. He battled with Zeus, and in one of many tales Zeus crushed Typhon’s smoking body under a mountain. Some say Zeus threw Sicily on top of him, giving Mt. Etna life. Here the monster’s legs are snakes and its palms are flush against the ceiling, holding it up. His gray-blue colors reflect the grimness of the realm of Charon and his lord, Aita (Hades). Typhon also appears like a representation of Hanuman flying down Mount Rishabha (which had life restoring herb ‘Sanjeevani’) from the Himalayas.